Description: An excellent salve with thirteen herbs including Plantain, Stone Root & other natural anti-biotic, soothing, calming, non-stinging combination of herbs. These may help decrease size & symptoms such as inflammation, burning & itching. Their natural properities could help improve healing time and give some relief to the uncomfortable symptoms associated with them. Also this soothing, calming, combination may help nettle rash, & non-allergic/ non-poisonous stings & bites too. 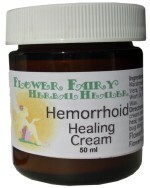 Flower Fairy Herbal Hemorrhoid Salve is a popular choice with Colonic and Hydrotherapy Clinics in their sessions & to give to their patients for hemorrhoids and irritation. Directions: A soothing salve for inflamed, burning, itching hemorrhoids. May help sooth nettle rash, & non-allergic/ non-poisonous stings & bites too. Ingredients: Cold pressed extra virgin olive and sunflower seed oils, yarrow, plantain, marshmallow root, calendula flower, chickweed, aloe vera root, chamomile, stone root, goldenseal root, echinacea, st. john's wort oil, natural vitamin e oil, & local bees wax.